Sculptor John Hachmeister is part of the chain of being at S.P. Dinsmoor's Garden of Eden. 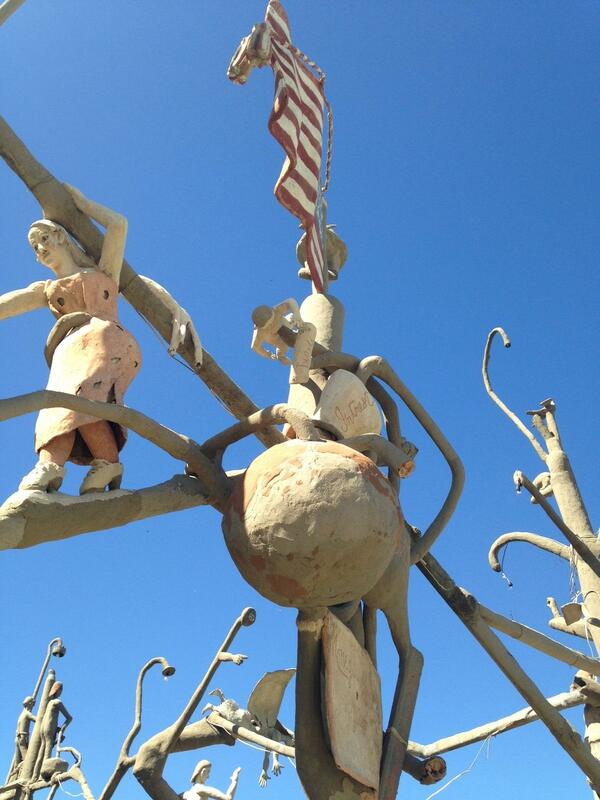 Sculptor John Hachmeister remembers the first time he saw the Garden of Eden, a mysterious outdoor sculpture environment built in Lucas, Kansas, right after the Civil War. "I grew up 35 miles from here," he says, "though I knew very little about the Garden of Eden, and at the time, it was growing up in Chinese elm trees and vines. You could see very few of the sculptures. What I remember is that it was very mysterious. It looked like a Mayan ruin." 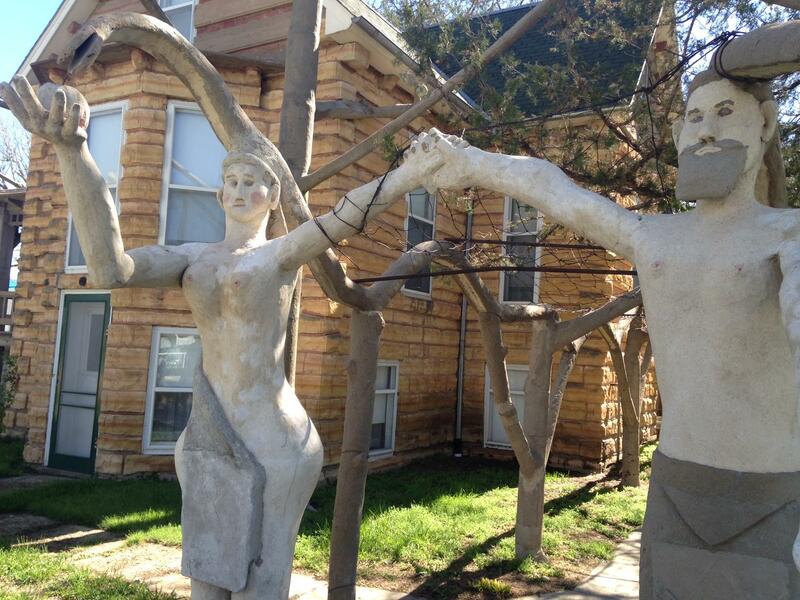 Nowadays, when you round the corner of Second Street and Kansas Avenue in Lucas, you can't miss the sculptures. They form a huge labyrinth of concrete people, animals and flags arching over a lawn, just outside a log cabin. Greeting new visitors are Adam and Eve, holding hands and naked save for concrete loincloths for modesty. This complex was built by a man named S.P. Dinsmoor. He came to Kansas from Ohio after serving as a nurse for Union soldiers in the Civil War. He couldn't serve as a soldier because he was short: just 5 foot, 2 inches tall. When the war was over, Dinsmoor wanted a fresh start. Brochures trying to lure people to Kansas enticed him. Dinsmoor, like many others, arrived to find what appeared to be nothing — not even trees. And farming in this arid part of the state turned out to be much harder than the newcomers had been led to believe. Some settlers even turned their covered wagons back around with signs reading, "In God We Trusted, In Kansas We Busted." Dinsmoor squeaked by as a farmer, making something of nothing. When he stopped farming, he moved into town and built a log cabin surrounded by lots and lots of sculptures that expressed his populist political beliefs. Once he started building, he just never stopped. And pretty soon, he was charging visitors for tours. The tours funded his retirement, but more importantly to Dinsmoor, they offered lessons in free thought. In one vignette, you have an octopus representing trusts and monopolies wrapping its tentacles around the globe, and as a result, a chain of violence beginning with a soldier shooting a Native American, and ending with a caterpillar devouring a leaf. In another, a preacher, a doctor, a lawyer and a banker have put "Labor" on a cross. As Dinsmoor got on in years, he told his daughters that he was going to die soon, and that he wanted to be mummified. "Like an Egyptian mummy," he's said to have told them. His coffin, with a glass lid, is in a mausoleum on the grounds, and you can visit as part of the tour. That was part of Dinsmoor's plan all along. He thought a mummified man on-premises would keep people coming long after his death. In a way, he was right. But it would take a while. After Dinsmoor died, weeds started growing over the sculptures. In 1969, a local family bought the property and took the first steps toward fixing it. They also re-opened it as a tourist site. But it wasn't until 1988 that the Garden of Eden met its real salvation. In 1988, John Hachmeister was a young sculptor working a day job as a brick-layer. He'd just purchased some worn-out land near Lawrence and he was in the courthouse to register it in a conservation program when he stumbled upon a land catalog. "I'll read anything," he explains. "And I was reading a land catalogue and it said, 'Historic tourist attraction near Wilson Lake for sale' and I thought, 'It can't be the Garden of Eden!'" John had been following grassroots art for a while, so he knew that a lot of sites like this one were being cut up and sold by the piece on the east and west coasts. He didn't want that to happen to the Garden of Eden. "Bear in mind I was a studio artist and a brick-layer at the time. I did not have very much money." He knew he couldn't come up with enough money to purchase the Garden of Eden on his own, but he created a limited liability corporation and sold stock to friends and others with an interest in grassroots art in Kansas. Nobody who purchased stock ever expected to see a return on the investment in the form of a dividend. Like John, they just wanted to save the sculpture and keep it together, in the place where it was built. By the time John had negotiated a purchase price, he had enough money for a down payment, and a plan to pay off the rest over thirteen years. Those 13 years were spent fixing things. Repairing the log cabin's roof, repairing broken sculpture parts. There was also maintenance to consider: mowing the lawn, weeding, giving tours. John made the trip from Lawrence to Lucas so many times that he completely destroyed a Ford F-150. He'd camp out at Wilson Lake with his son, who would play while his dad worked. At the end of the day, they'd wash off in the lake, then get up in the morning and do it again. Adam and Eve greet visitors at the Garden of Eden. At a certain point, he realized that there was more to do than he'd ever be able to accomplish on his own, with the amount of money he had. Enter Kohler Foundation, Inc., which is based in Wisconsin. John had done some work for the organization and knew that it had a program specializing in the restoration of grassroots arts environments. John drove to Sheboygan and made a pitch for the Garden of Eden to be among the sites that Kohler took on. After a couple of years of conversations, they almost had a deal. They were hammering out paperwork at the concrete picnic table that Dinsmoor built, when John noticed something. The Kohler Foundation planned to close the Garden of Eden to the public during the restoration process. "People who come to the Garden of Eden, they go downtown, they go to the meat market," says John. "We couldn't close the Garden of Eden. We had to stay open." There are just under 400 people living in Lucas, Kansas, and that's a number has been shrinking for a while. Just about every business in Lucas carries this brochure, or "handheld analog wayfinder" to all the art destinations in town. That's in large part because of changes in agriculture, an industry that's industrializing and doesn't require as much manpower as it used to, meaning it provides fewer jobs for people living in towns like Lucas. So as time goes by, the role of grassroots art in this community is more than a curiosity. It's also a source of jobs and revenue. Grassroots art, once the domain of outcasts and rebels, is now something everyone here cares about, and everyone here participates in. Douglas Brant of Brant's Meat Market can't put an exact number on the percentage of his sales that comes from tourism, but he says it's a lot. The meat market's been in his family for 93 years and specializes in Czech-style cuts of meat. It's a popular hangout for tourists as well as townies, like farmer Greg Bland and manufacturing plant manager Les Schneider. 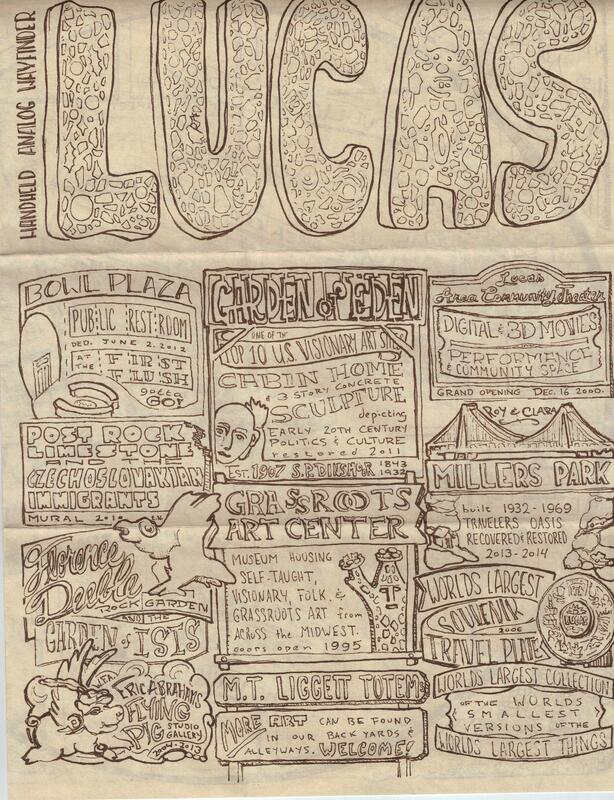 They're big fans of what grassroots art has done for Lucas. They've seen tour buses on Main Street, which they realize is unusual for towns this size. Les has even participated in a few grassroots arts projects, like a public restroom in the shape of a toilet, with mosaics on the walls of the interior. The mosaics are made of bits and pieces of whatever Lucas residents had in their homes, and they were pieced together by the townspeople's hands. There's also the Grassroots Art Center located on Main Street, run by Rosslyn Schultz, who visits grassroots artists all over Kansas to interview them and eventually, to show and even sell their work in Lucas. An old theater, also on Main Street, is being rehabbed by a volunteer staff. Lucas is home to the World's Largest Collection of the World's Smallest Versions of the World's Largest Things. And don't forget Florence Deeble's Rock Garden. The anchor destination, however, is S.P. Dinsmoor's Garden of Eden. Douglas Brant holds court behind the counter of the meat market that's been in his family for 93 years. "As we watch this part of Kansas depopulate, there is an issue of who's going to be left, and what happens to the Garden of Eden. How can we keep this a secure place?" John asks. "These are the things I would stay awake at night and worry about." That's why he worked an addendum into his contract with Kohler Foundation specifically stipulating that at no point would the Garden of Eden be closed for restoration. It would stay open the whole time. "If it was a deal breaker, it was a deal breaker," he says. "When you're an artist, you take risks. Part of being an artist is actually enjoying risk-taking." It wasn't a deal-breaker. The sale went through, and the restoration revealed parts of the Garden of Eden that even John had never seen before. "They started power-washing," he recalls. "I thought they would come in with soft brushes and soap. They know concrete, and they came in here and blew so much crud off the concrete. All of the sudden, you're seeing pink in the figures, the women have pink in their cheeks... and you see the sort of nuance in the sculpture that had been obscured by mold and moss. It was amazing." John paid back his stockholders, and formed a non-profit: Friends of S.P. Dinsmoor's Garden of Eden. When the restoration was complete, Kohler Foundation deeded the site back to the local community by way of that non-profit. John's still the official president of the board, and the unofficial handyman-in-chief. But he claims he won't be forever. "Honestly," he says, "the money wasn't the deal. It was the wonderful opportunity to literally own something so wonderful, and then to let it go. At some point, I'll turn in my keys and I won't be part of this any more. And that's life." Gina Kaufmann is host of KCUR's Central Standard. She can be reached on Twitter @GinaKCUR. It's Saturday morning and Sherry's Place, the only bar in Keytesville, Missouri, is full of life. Kids are playing pool as adults enjoy beers at the bar. But just outside, the street is desolate. The only sounds are caused by an eerie breeze — the waving of an American flag and the creaking of sheet metal patched over a missing window. As the agriculture industry changes, what it means to grow up on a farm is changing, too. Our panel talks chores, the cycle of life, the dangers of farming and the lessons in business and character that farm kids learn. Plus, leaving the farm for the "concrete jungle," and city kids pursuing agriculture as adults. What is folk art? It's a seemingly simple question, but answers may vary. And when you put folk art in a museum... is it still folksy? Stories, insights and observations.